The Bödmerenwald has been well-known for years. It is the largest continuous area of woodland in the municipality of Muotathal and it is owned mainly by the Oberallmeind Cooperative Schwyz. The so far oldest notice of a large bear hunt in Muotathal is dated from 1735. In 1971 the ETH Zurich sealed a contract with the Oberallmeind Cooperative for the lease of 4.8 ha of Bödmerenwald for research purposes. In 1974 the idea of the “Bödmeren Nature Park” took shape in the tourism strategy of Muotathal. 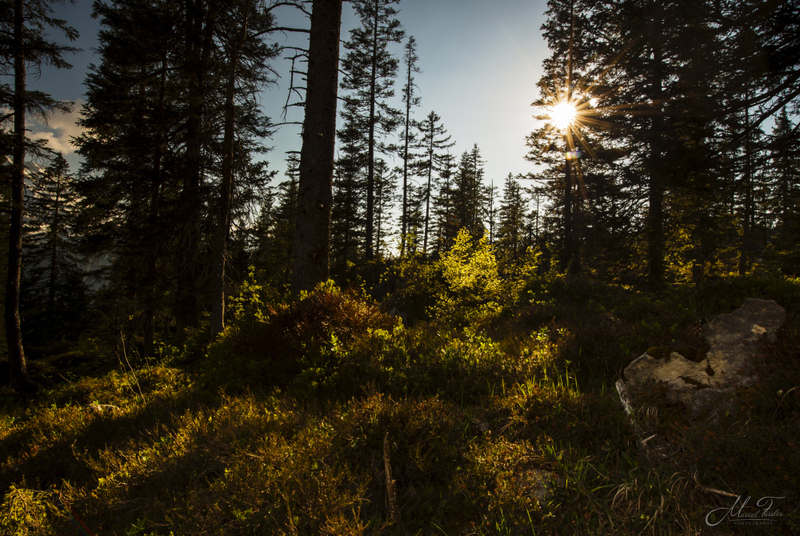 In 1978 the head of the Cantonal Forest Service Walter Kälin contacted the federal government with the request for a second “National Park” within the territory of Bödmerenwald. In 1982 preparations for a “Virgin Forest Reserve Bödmeren” were on the way. On 25 July 1984 the foundation “Forest Reserve Bödmeren” was formed and 70 ha of forest were protected. The donors were: the Swiss National Day Donation, Zurich, represented by Adolf Ehrsam, Küsnacht ZH and Kurt Roderer, Langnau am Albis; the Canton of Schwyz, represented by Walter Gisler, member of the governing council, Immensee, Walter Kälin, retired head of the Cantonal Forest Service, Rickenbach and Viktor Voser, head of the Cantonal Forest Service, Schindellegi; the municipality of Muotathal represented by Georges Schelbert, vice-mayor, Muothatal, the Oberallmeind Cooperative Schwyz, represented by Werner Schnüriger, president, Steinen und Othmar Betschart, recorder, Schwyz and the Schwyzer Kantonalbank, represented by Franz Beeler, director, Schwyz. In 2009 the Oberallmeind Cooperative extended the area of the forest reserve to 550 ha thanks to considerable funding from the Hauser foundation, Weggis. 3. Conservation of the beautiful forest and landscape scenery. 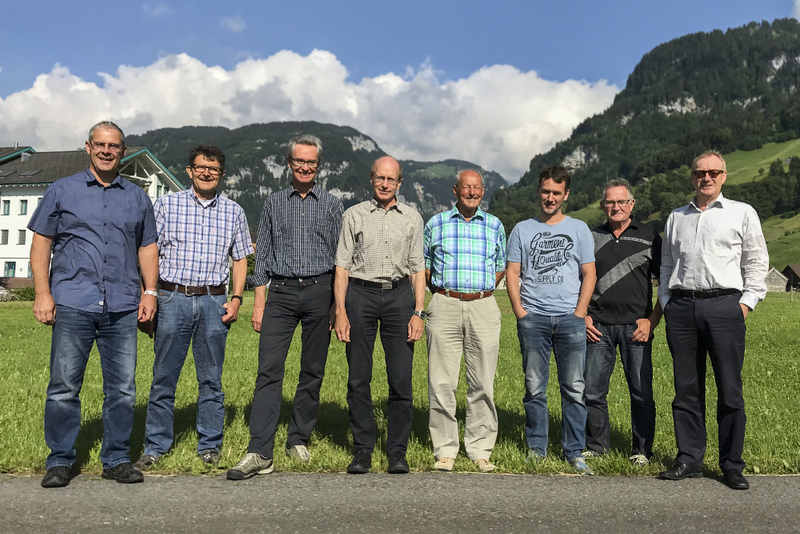 Additionally, the reserve Bödmeren will be used for scientific research by the ETH Zurich and the Swiss Federal Institute of Forest, Snow and Landscape Research WSL, Birmensdorf, as well as further research institutes. Further members can be invited at will by the foundation council. In 2006 the foundation council decided to issue leaflets about the virgin forest Bödmerenwald. Goal of this measure was to raise awareness for the uniqueness of the Bödmerenwald. In 2009 the brochure “Bödmere üse Wald” (Bödmeren our forest) was published. Foundation Council from the left: Josef Märchy (Präsident der OAK), Dr. Stefan Lienert (wissenschaftlicher Beirat), Dr. Peter Brang (Vertreter der WSL, Birmensdorf), Dr. Felix Lüscher )Bereichsleiter Wald der OAK), Walter Gwerder (Präsident der Stiftung), Patrick Gisler (Aktuar& Revierförster), Franz Föhn (a. Gemeindepräsident Muotathal), Markus Gwerder (Kassier & Vertreter der SZKB) Es fehlen: Theo Weber (Amtsvorsteher AWN) und Prof. Dr. Harald Bugmann (Vertreter der ETH Zürich). Bank connection: IBAN CH92 0077 7001 4064 6101 5.